New Super Mario Bros. Wii is a classic — a pure and necessary update of an eternal game for the group screen. With New Super Mario Bros. Wii, we can fi nally do it together — as many as four separate players, taking to the screen simultaneously, filling the entire TV and living room with bouncing Marios, Luigis and Toads. It’s wonderful, and very quickly the laid-back soundtrack turns the whole situation into a videogame lounge full of lava levels and giant mushrooms. A few pieces of architecture move in new manners. A monstrous studded metal spike punches through an entire, wide-screen level. And the Goombas have been joined by glowing fi sh skeletons and long-legged ambling insects. But for the most part, New Super Mario Bros. Wii offers the same type of friends, foes and challenges that have faced Mario (and Luigi) during all of their classic adventures. The classic gameplay gets its durability from its simplicity. Faced with the early Nintendo Entertainment System’s controller — a small plastic box with a cross-shaped directional pad and two buttons — Mario (and Luigi) faced puzzles and enemies that required simple commands executed with exacting touch. Jump, climb, run, slide — all easy to do. Mario’s genius is to require the player to do them with judgment and coordination. The Wii Remote is a light, brilliant update of the old NES controller. Turned on its side, the Wii Remote loses its power as a pointer. It becomes one of the simplest videogame controllers ever designed, and it embodies all of Mario (and Luigi’s) jumps and dives to perfection. 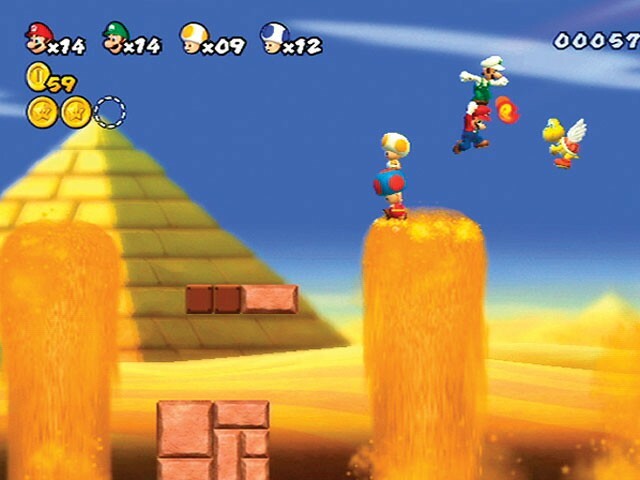 The Wii’s motion-sensitivity only comes into play in a very welcome yo-yo like spin that extends Mario’s jump. I wouldn’t have guessed that the biggest challenge Mario would have to surmount is friendly fire. I guess I’ll have to start treating Luigi like a brother too. THE GOOD: The Penguin Suit transforms the brothers from tubby landlubbers into aquatic assault beasts with cute beaks. It may replace the Tanooki Suit as the Mario Bros. most legendary costume. THE BAD: Most of the interesting new monsters and puzzles get a full level or two to flourish their treachery. Then they’re retired. Or maybe they’ve just been sent ahead to the sequel. I look forward to seeing more of them. THE BOTTOM LINE: New Super Mario Bros. Wii is a classic — a pure and necessary update of an eternal game for the group screen.